Parking is $5.00 per day. Cafeteria is inside the courthouse. 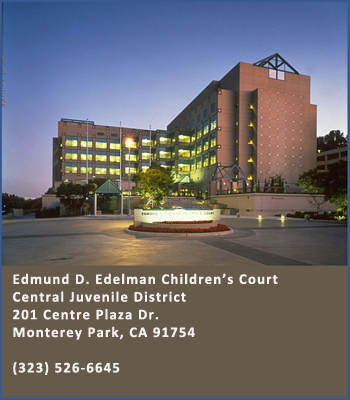 Most Juvenile Dependency cases in Los Angeles County are heard at the Edmund D. Edelman Children’s Court, which was opened in 1992. This large court was planned for years in the late 1980’s so that it would be a model Juvenile Court building designed for the needs of children and families. Unique features for its time included smaller courtrooms, lower judge podiums, and a complete youth center in which foster children who come by a system of county transport vans –without caregivers– have indoor and outdoor facilities for play and study. As in most things “California.” The Edmund D. Edelman Children’s Court was the first of its kind and now serves as a model to other Dependency Courts around the country.